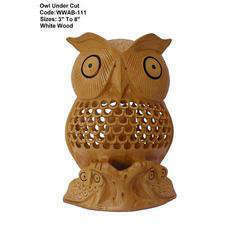 We are a leading Manufacturer of wooden owl carving and wooden owl sculpture from Jaipur, India. 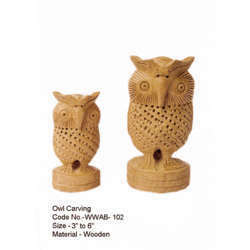 Wooden Owl Carving offered is designed and developed by experienced workforce who specializes in precision crafting of wooden owls so as to meet aesthetic demands of the customers. These flawlessly handcrafted handicraft pieces are made from good quality wood that also allow us to provide in these seamless finishing, superior finished looks as well as ensuring that the carved pieces are a close copy of the projected image of the owls. Further, our team of experts also ensures that the beautiful creations delivered are acknowledged for their detailed and attractive wood work finish. Wooden Owl Sculpture offered comprise designs that portray excellent workmanship of talented craftsmen in coming up with excellent woodwork pieces of owl that make these suitable for use in areas like hotels, restaurants, residential apartments and other similar places. Further, as these are made from seasoned hard wood, these do not warp & decay and come with premium quality polished finish. Further, these are also acknowledged for their its superior finish, minute detailing as well as the perfect reflection of creativity and excellence in the carved wooden piece.